"Episcopal Bishop John Spong has taken a scalpel to the heart of Christianity. As with all heart operations it wll be seen as either life-enhancing or life threatening, depending on one's perspective. In 'Resurrection: Myth or Reality?' 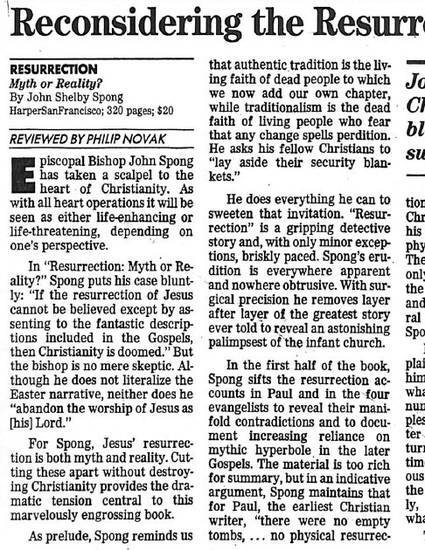 Spong puts his case bluntly: 'If the resurrection of Jesus cannot be believed except by assenting to the fantastic descriptions included in the Gospels, the Christianity is doomed.' But the bishop is no mere skeptic. Although he does no literalize the Easter narrative, neither does he 'abandon the worship of Jesus as [his] Lord.'"